What are hammertoes and how do you get rid of them? Are your toes bent or crooked? Do they rub against the top of the shoes? Well, if they are, you are suffering from hammertoes. These are toes that are bent and sometimes are sticking up. A lot of people suffer from corns, which is hard, thickened skin that forms on the top of the toes. Sometimes, they form between the toes. So, if you have a hammertoe, the toe can rub against the shoe or against another toe. This constant rubbing causes friction, which will lead to the formation of the corn. Corns do not have any roots. This is why over-the-counter medication called corn removers, really don’t remove corns. These non-prescription items have an acid in them, and they just “burn” the dead skin. The problem is that it can also burn the good skin. In severe cases, the medication can cause an infection. This is why the label says, “do not use if you are a diabetic.” Diabetics do not heal as quickly and this infection can lead to severe problems. Then how do you get rid of the corns. Let’s get back to the cause, which is the hammertoe. In order to eliminate corns, the toes need to be straightened. 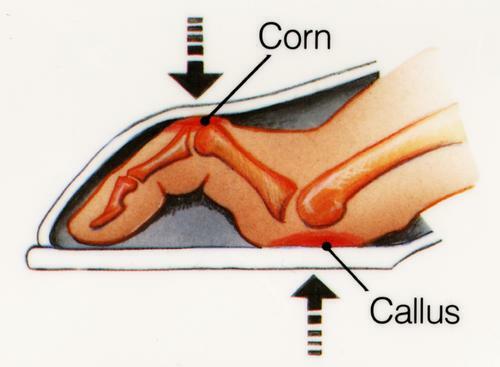 This is a minor surgical procedure, where a piece of bone under the corn is shaved, and the toe is now straightened. In most cases, a removable pin will need to be placed into the toe to keep it straight. The pin is removed in three to four weeks and is not painful. You see, bones do not have any nerve endings, so you don’t feel the pin. After about three or four weeks, the pin is not needed and loosens up. It usually just slides right out. So, you might ask, “if bones do not have any nerve endings, then why does a broken bone hurt so much?” The answer to that is, when you break a bone, you get a tremendous amount of swelling due to broken blood vessels. This swelling will press against the nerves of the area and cause pain. During the three or four weeks after hammertoe surgery, you will be walking in a walking boot. If you have a job that requires you to sit most of the time, you can go back to work within 3-5 days. After the three to four week period, you can get into your sneakers. It can take a few months before you get back to your three or four inch heels. Most exercise routines can be resumed after a month but running might take you a few weeks longer. Surgery is not the only treatment for hammertoes. Of course you can change the style of shoes you wear or you can put non-medicated pads on the toes, just to relieve the pressure. In addition, you can have your corns trimmed periodically by your podiatrist. However, surgery is the only permanent solution. Most important, you don’t need surgery if are not in pain or if the corns are not red or swollen.